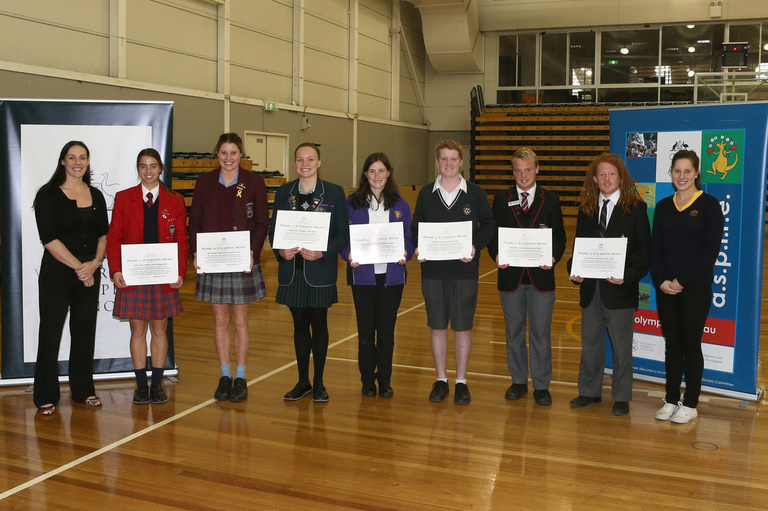 Every year at Mentone Girls SC the Pierre de Coubertin Award is given to a Year 12 student who demonstrates academic excellence and sporting prowess whilst exemplifying the Olympic values. 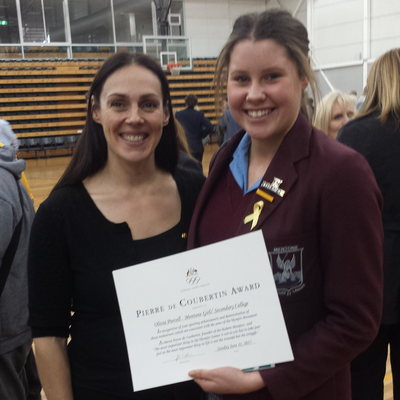 In 2017 this prestigious award was given to Sasha Long for her dedicated and wholehearted effort for MGSC and Melba House throughout her schooling. Along with Vivian Fidantsis and Sarsha Berntsen - Olympic Academy recipients, all three students represented Mentone at the MCG for the Olympic Academy where they met and discussed the 2016 Rio Olympics with Australian Olympians. 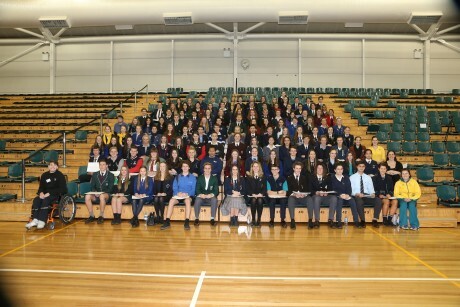 Congratulations to Sasha, Vivian and Sarsha for attending the Academy and to their efforts over their high school years. 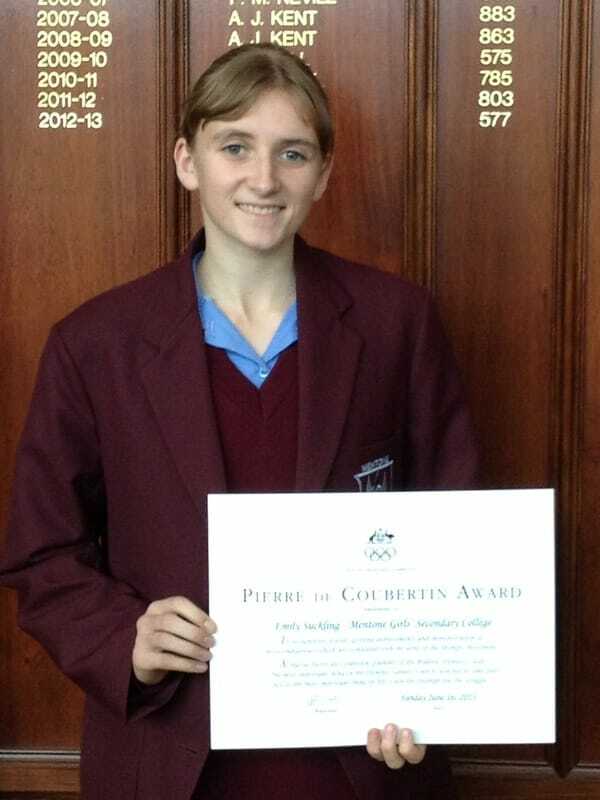 Every year at Mentone Girls SC the Pierre de Coubertin Award is given to a Year 12 student who demonstrates academic excellence and sporting prowess whilst exemplifying the Olympic values. This year this prestigious award was given to Marley Berntsen for her dedicated and wholehearted effort for MGSC and Jackson House throughout her schooling. 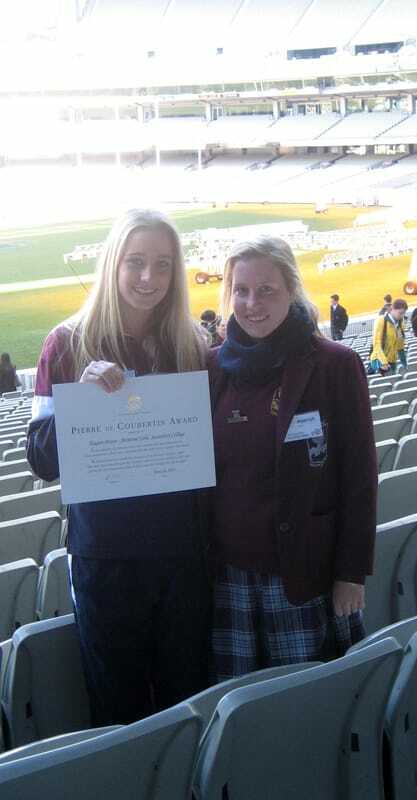 Along with Maddie Culshaw and Charlotte Byrne - Olympic Academy recipients, Marley represented Mentone at the MCG for the Olympic Academy where they met and discussed current issues with Australian Olympians such as the path to the Olympics, sugar content in daily foods and translating the Olympic values to regular day life. Below the three participants responded to a series of questions. Enjoy. 1. Did you enjoy the Olympic Academy? ​Marley - Yes, I enjoyed the it. I feel very lucky to have been awarded the Pierre de Coubertin and that I had the opportunity to go to the MCG to take part in the activities and talk to some of the 2016 Rio Olympic team. I think that especially because it is the year of the Olympics it was that bit more exciting. Maddie - I really enjoyed it - great opportunity and was very lucky and grateful to be chosen! 100% recommend it for future sport-orientated students as you get to meet hundreds of other students who are similar to you and allows you to meet some of the highest, elite athletes in the world. Charlotte - Yes, I had an awesome time at Olympic Academy. It was a fantastic opportunity to socialise with other sporting teens across the state, and the day gave me a lot of skills and memories that I will cherish for a long time. It was also a really amazing experience to meet Olympians, both former and current, and get an insight into their lives as professional athletes. 2. What activities did you take part in and what were they trying to teach you? Marley - ​Out first activity was our chat session with an Olympian. 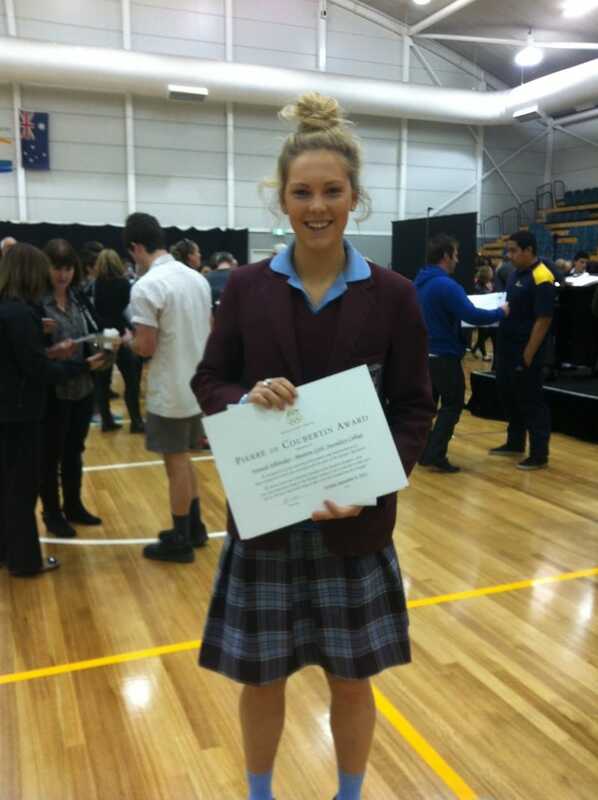 We got to speak with Carmen Marton, who will be representing Australia in Taekwondo. We learned about her training program and weekly schedule as well as the physical and mental preparation that needs to be taken before competition. In our second rotation we worked with a VicHealth and they spoke to us about making the switch form sports drinks, soft drinks, flavoured milk etc. to water. We did an activity where we read the sugar contents of each drink and converted the amount in milligrams to teaspoons and piled sugar cubes in front of the drinks. We also brainstormed ideas on what we could do to encourage students to make water their drink of preference. In our third rotation after lunch, we went to the National Sports Museum where we listened to two of Australia’s past Olympians speak about their Olympic experience and then we did a scavenger hunt to find the answers about past Olympic trivia. Maddie - We started off the day with a getting-to-know-you activity with other students which was good as it allowed us to connect with people that we wouldn't usually met. We then had a talk from a former Olympian who we found out went to Parkdale Secondary College and was very interesting and had some good stories. We were then split up into our groups and the first activity we were involved in was the 'meet the Olympians'. Here we got to have a question and answer time with Caroline Marton - a taekwondo champion, she is representing Australia in the upcoming Olympics. We heard about her life and how she got to where she is now and then asked her some questions. We then had the activity where we focused more on the health side of the day. We had a session with VicHealth where we learnt how much sugar are in our daily food intake and how certain drinks have very alarming amounts of sugar in them. It was very interesting and we learnt a lot. We then had lunch which was nice as we got to chat to a few other people from different schools. We then had a tour of the MCG sports museum that I never knew existed - it was great. Our tour guides for the museum were two former Olympians, Pam Kilborn-Ryan had won gold back in the late 1990's. It was very interesting and we definitely learnt so much from the day. We got so much out of the day and I would do it again in a heart beat! Charlotte - Throughout the day, there were four different activities. Firstly, we listened to an interview with Carmen Marton, an Olympic taekwondo athlete on the road to Rio. She spoke about her experiences as an athlete, the challenges that she has faced throughout her career and how she overcame them, and also about how she is preparing for the Olympics in Rio. She also taught our group about the rules taekwondo and gave a demonstration of different kicks. After the interview, VicHealth gave an informative session on the sugar content in energy drinks. We compared different types of drinks based on their sugar content, and looked into the benefits of water as a substitute for sugar filled drinks. After lunch, we met with two former Olympians in the National Sports Museum and had to complete a quiz on the Olympics, based on the information in the museum. This was really fun, and it was really cool to see all of the collected materials and memorabilia from each Olympic games. To conclude the day, there was a leadership session, which required everyone from different schools to cooperate and work together to complete a number of different activities. I really enjoyed this, as I got to bond with different sports enthusiasts from around Melbourne. 3. What was the highlight of the experience and would you recommend it to future Pierre de Coubertin candidates? ​Marley - For me the highlight was definitely the third rotation because it was really interesting to look around the museum at the olympic displays and learn about past olympic teams and venues. I would certainly recommend participating in the day to future Pierre de Coubertin recipients. Maddie - ​I think for me, the highlight of the day was listening to Carmen's story of how she got to where she is and the hard work and effort she put in. It made me feel quite motivated to work hard as in time it pays off and you can achieve the impossible. 100% recommend to future students - great day, great stories and great people! Charlotte - I found that the highlight of the day was definitely hearing from the Olympians. Listening to Carmen Marton talk about the road to Rio was really inspiring. It was also great to hear her talk about the balance between school and sports. However, the whole day was such an amazing experience, and any future Olympic Academy or Pierre de Coubertin recipients should definitely make the most of the day - it was unforgettable! Congratulations to Marley, Maddie and Charlotte for attending the Academy and for their efforts over their high school careers. We are extremely proud of you!